You work from home and unfortunately, your home office does not allow you to be creative or productive. It doesn’t feel quite right, space planning seems to be a struggle, you’re having a hard time getting things done, and there is no.where.to.put.anything! On top of that, it is SO cluttered. It is time to make some serious changes in this space. First, let’s talk about the importance of this. You’re probably thinking, “But Dani….how on earth is my home office going to make me more creative and productive” and I’m gonna give you a little nugget of knowledge. When you have a space where you feel good, good is reflected in the content you create, your interactions with people, and the business you are promoting. SO…let’s get your office looking and feeling amazing so that you can create amazing and inspiring content for your following. Let’s talk about LAYOUT. Layout is huuuuuuge when it comes to your office. There are a few simple rules to follow when setting up your space. We’re gonna pull out some Feng Shui principals to really have your office feeling bright and fresh and get your productivity and creativity flowing. Your back should never face the door. You’re really going to want to face the door if at all possible. This will make you the commander of your space. You’re in charge, you’re a badass, you are the owner of this space. If you cannot follow #1, get a mirror to hang so that you can see the door. Keep that energy flowing as much as you can. I want to step a little bit past just getting rid of items that don’t bring you joy. Yes, items in your home should bring you joy, however, some items you just have around to be functional. So, I always suggest to my clients that they start simple. Look around and get rid of all items that are not related to an office or your business. I know that some offices also function as guest bedrooms, baby rooms, etc. but do what you can! Even if you only have a small desk space-you have to work with what you have, honey! Make the most of your space. Take this time to organize your space. Think about the 5 items you use the most in your space and make sure they have a specific place that is easy for you to reach so that you can grab your tool and spend the majority of your time creating. If you have a plethora of office supplies, make sure they have a place to be stored. If you use a laptop or desktop, make sure it’s set at a comfortable height for you. Poppin is my favorite resource for office supply organization. Check them out! Next step is to get some plants in the space! Bring a little life in, improve air quality, and promote calm in your space. Not only will these look great but they will keep you calm and ready to tackle anything your day could bring. OH, and the BEST part? Green symbolizes wealth and will bring more money to you in your business endeavors. 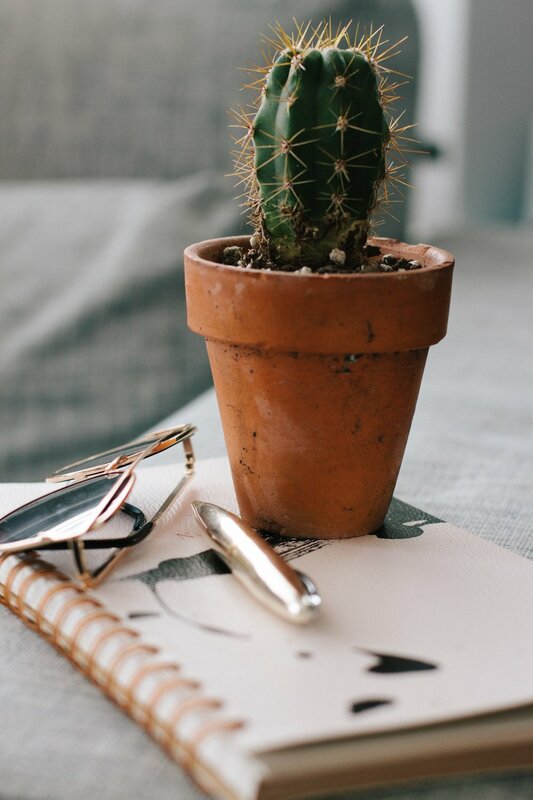 Check out my blog post, Why You Need Plants In Your Home to find out more info about where to buy the best plants and all of the health benefits that they can have! Alriiiiiiiigtttt step 4. Shall we? Take a page out of Maria Kondo’s book and bring in a few items that make you happy. Bring in a little inspiration. Why do you have your business? What makes you happier than anything else? Put some reminders above or around your desk and take a minute every day to remember why you do what you do and who you do it for. Maybe your daughter is why you do what you do. Make sure to have a picture of her there as a little reminder. Maybe your love of fashion has inspired you to start your fashion business. Frame a few of your favorite fabrics, artwork, outfits that inspire you. Are you self-motivated and expressing yourself fully in your business? Throw your vision board up on your wall. For me, beautiful views and natural sunlight are what make my heart sing and inspire me to create next-level content for my followers. We live near the mountains, so some days I actually sit in the living room or kitchen so that I can see the beauty of those mountains. The window in my office is always open and the blinds are always open. I don’t care how bright or hot it is, natural light is EVERYTHING to me. It makes me feel alive. And that’s how you should feel every single time you sit down to work. Now you have a new space and should be feeling fantastic! Need a little extra help getting your space feelin’ fly? Interested in more tips to creating happier and healthier spaces? Check out our bi-weekly newsletter.